My first Christmas away from our immediate family in the U.S. and wow was it relaxing! Our host family made this holiday away, so incredible and memorable. Tempting us from taking a trip every holiday, just to escape the stress. We love our families, but we always end up feeling guilty we did something wrong or didn't spend enough/equal time with everyone. Yet, still feel like we didn't spend enough time with any one family, before the holiday season ends. It truly is impossible to balance everyone's time, every single year. This year, was the first year we didn't have that feeling. Maybe it was the distance, maybe we have grown to not be so paranoid? Whatever it was, we truly enjoyed being with our friends in New Zealand to celebrate this Christmas and New Year's. Thank you B Family for making us feel so included! Christmas Day celebration was nearly identical to my traditional day: eat, drink, open secret santa gifts, chat and be merry! The only difference was that we didn't have to bundle up in layers to go outside and the dinner table was outside under the sun, instead of set up in front of the roaring fireplace. There was no snowmobiling, sledding, ice skating or ice fishing this year, but there was worry that everyone had a hat or sunscreen on. How did Santa know we were here??? Riley taking it all in. I couldn't believe where we were everytime I had a second to consider it. I had heard about this place called New Zealand for the last 13 years, always saying that it is Kev's "other life". One that I had never known, but sounded absolutely amazing. The kids have no idea how lucky they are to have seen so much of the world in their short lives. More presents for us? We must be the luckiest little kids around. Sesame Street Live on stage at Plaza Singapura until Christmas. Little Miss M singing along, dancing and Riley trying to keep up doing the Hustle was the best part of the show for me. It's a short show, but they kept the kids engaged the entire time counting, singing, typical Sesame Street style practicing their alphabets and dancing. Don't get me wrong! It's a wonderful show, I just really enjoy seeing the excitement on my own children's faces and seeing them having fun, more than anything in the world. They would love to go back for every show, which is twice a day and three times a day on the weekends...I'll keep that part a secret from them for now and replay the video a couple times instead. Once a month the management staff at our Serviced Apartment throws a Residence gathering with free-flow tiger, wine and sometimes other fun drinks along with a buffet of food. This month they made it into our Christmas celebration and invited a fabulous choir to sing some carols. Made me a feel a little homesick, but still found the Christmas songs entertaining when they changed a few versus, "we know there won't be any snow, but we can still dream..." worked into the Winter Wonderland carols. Santa Claus was suppose to stop by for a quick hello, but we do live in Singapore and rain was inevitable, so his sleigh couldn't get through the downpour. If it had been snow, there wouldn't have been a problem....just sayin'. It's starting to feel alot like Christmas! My favorite time of the year. It's been a quiet kind of week, in attempt to get everyone feeling well before our Christmas holiday down under. We are scheduled to fly out on Thursday to New Zealand and without fail, we have been to the doctor 3 times in the past week. Hopefully, the prescribed antibiotics will kick the cough, runny noses, ear infections and sinus infection trying to take over our household, before our holiday begins. I have been looking through our closets, trying to find some long sleeves and pants ~ we have a few, but not many. I left some behind after our trip back to Minnesota, thinking we wouldn't be going anywhere cold. I have come to realize that cold has a different meaning to the children, than it does to me at this point in their lives. I grew up in winter tundra land, but Riley has spent half of his life here, on the equator where the average year-round temperature is around 90F. Needless to say, that the refreshing, comfortable 70s will feel a bit cool for us all. Kevin has been trying to remember back to his Christmas holiday beach trips growing up in NZ and can only recall swimming and hanging out on the beach all day, telling me we won't need warmer clothes, we'll be at the beach! I refer back to the 10-day forecast stating the actual temperature highs and lows and remind him that we aren't coming out of winter. We are coming out of the tropics. It will be nice, but it will feel cool to the children. Funny how that works. Makayla said she was ready to go home. I asked her, "what exactly do you mean...home? Which home would you like to go to?" Her reply, "where daddy is!" Meaning, Singapore. After 6 weeks of being away from him and 9 months of being away from "our big house where the other people live", she has come up with the understanding that home is not where all of her toys, books, clothes and bed may lie, but rather where our family of 4 is together under one roof. Sure, we all enjoyed our extended holiday back to the U.S. to stay with several relatives and friends over the course of 8 weeks. We even had a chance to spend some time at our house, that we are renting out, and had the opportunity to catch up with some of our old neighbors and pet friends. I thought at first that it would confusing for the kids, bringing them to their old house, where TT lived with us and we were only a short drive from all of our grandparents and, at the time, cousins. But, she wandered around the house with the furniture still intact and eventually, found her way to her old bedroom. I think this was the moment she actually realised that this was our old house. Then, made her way into Riley's old room, "what happened to Riley's crib?!" It has been confusing trying to figure out where home actually is for all of us. I once thought that it was the place that all of my belongings were stationed ~ our home base. Currently, we don't have that home base available to go to, having rented our house in the U.S. furnished. We have more "possessions" in storage, some scattered throughout our parent's homes and a few things here, with us, in Singapore. Yet, when Little Miss M told me she wanted to go home, I knew exactly what she meant. We were only 2 airplane rides and 2 taxi fares away ~ about 10,000 miles and we were there. Hugging daddy with a great big smile. Prior to our move to Singapore, people we talked to that had previously lived on the Little Red Dot would always say the same thing, "Oh, the Christmas lights on Orchard are amazing!" Last year, we had our pre-move trip in December and were awwwed by the amount of lights and how they were displayed. This year, I was looking forward to the time they were finally switched on again. The massive, brightly displayed trees and ornaments hanging over the road and up the tall buildings are worth a look. Every time I go out, there are more and more trees and lights going up around me. This morning, I went downstairs and they were decorating the massive evergreen tree in both of our lobbies. You can not find a real evergreen in Singapore, so they had them shipped in from overseas, jut to capture the scent so familiar with my traditional Christmas'. The smell of evergreen...Love! 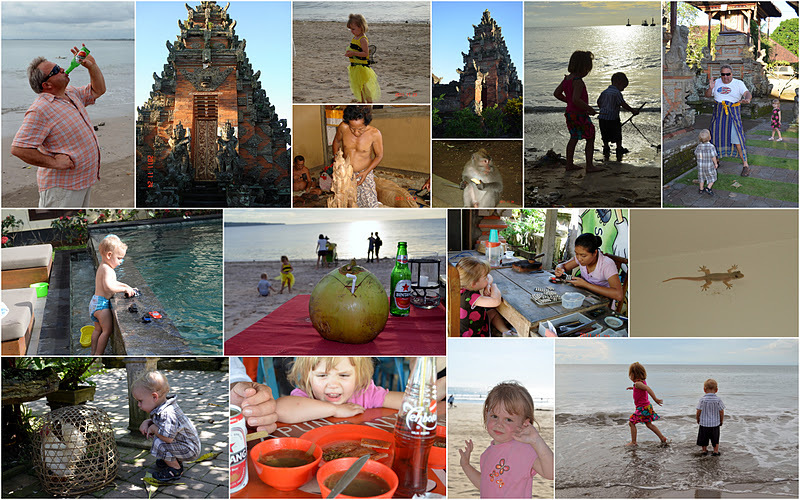 Terraces of rice, temples, beaches, shopping and relaxing by the pool at our villa.....Bali. I have to admit that the "perfect, white sand beaches of paradise" didn't quite live up to our expectations, but after we adjusted our mindsets a bit, we really enjoyed the culture. The most popular temple we went to was the Tanah Lot Temple, one of seven sea temples around the Balinese coast. Each of the sea temples were established within eyesight of the next to form a chain along the south-western coast (Wikipedia). The Tanah Lot has a natural spring on the underside of the rock, where the holy water for Hindu ceremonies at the temple is fetched. No swimming allowed out of respect of the Gods within 100meters of any temple, but we could walk in the Indian Ocean waters. The volcanoes, mountains, rice terraces that make up the landscape art throughout the entire drive to Kintamani was breathtaking. Arriving at the active Batur Volcano that stands 1717m with beautiful Lake Batur at its foot, we welcomed the fresh, cool breeze and the cool humidity free air. I would've loved to hike up the volcano, then down the mountain to the lake for a swim...next time! 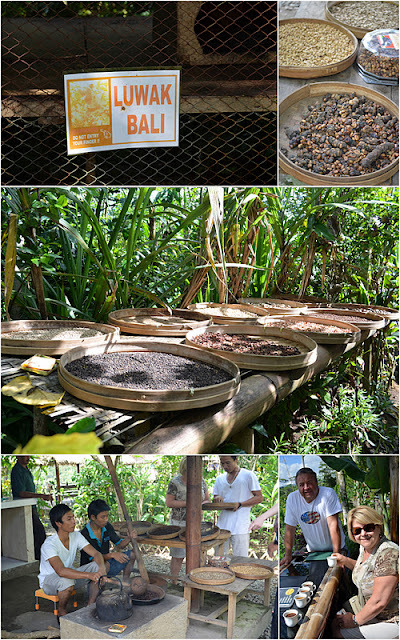 Bali harvests the most expensive coffee in the world ~ Luwak coffee. Luwak is a local name of the Asian palm civet in Sumatra. Kopi Luwak or civet coffee, is coffee made from the beans of coffee berries which have been eaten by the Asian Luwak, then passed through its digestive tract. A civet eats the berries for their fleshy pulp and chooses to eat only the best of the berries, leaving the rest. In its stomach, enzymes seep into the beans, making shorter peptides and more free amino acids. Civets also eat small vertebrates, insects, ripe fruits and seeds. Passing through a civet’s intestines the beans are then defecated, having kept their shape. After gathering, thorough washing, sun drying, light roasting and brewing, these beans yield an aromatic coffee with much less bitterness, widely noted as the most expensive coffee in the world. After learning of the process to make this expensive coffee, I couldn't stomach the thought of drinking it. Papa tried a cup, but didn't care for it. We explored temples, a volcano, rice terraces, swam in the Indian Ocean, shopped the markets, watched the sunset of Bali, went to the Monkey forest, purchased our first Mahogany wood Buddha Statue after seeing how they are hand carved, drank some Bintang, experienced the Suckling Pig delicacy, watched Silver jewelry being made and still had time to relax by the pool and read a book. Riley shopping for a new hat. My favorite part of the private villa in the Seminyak area of Bali, was the open air bathroom and shower, along with the private pool to swim even after the kiddos past out. Apart from a few mosquitoes buzzing around and the slippery when wet (which happened to be all day long) marble floors, I enjoyed having the privacy. Well...private when the cook/security guard/gardener and driver weren't peeking through the front blinds. Yes, Papa, it would have been nice to be on the beach, but the 10 minute walk down the hill, really wasn't that far off. Especially, since we had someone to drive us there. Makayla started swimming on her own, with no floaty muscles! She is so excited to be going with no floats, comes up for air and goes back down with a smile. She is now starting to go the short length of the pool ~ Big girl! Since Bali is the only island in Indonesia that is Hindu majority, rather than Muslim, there are temples all over. Even our villa had an area for offerings (prayer) twice a day. I actually forgot that it was Thanksgiving until my mom mentioned it that afternoon. It's a USA holiday that had no mention on the Indonesian island of Bali. So, we went for a beautiful sunset and not so good seafood dinner at Jimbaran beach, in lieu of the traditional turkey, gravy, sweet potatoes and lefse. It was a little weird not celebrating the traditionally important day, but all that was really missing was our large family gathering at one of our parents homes (and maybe a little snow). It was nice to have my parents with us though!